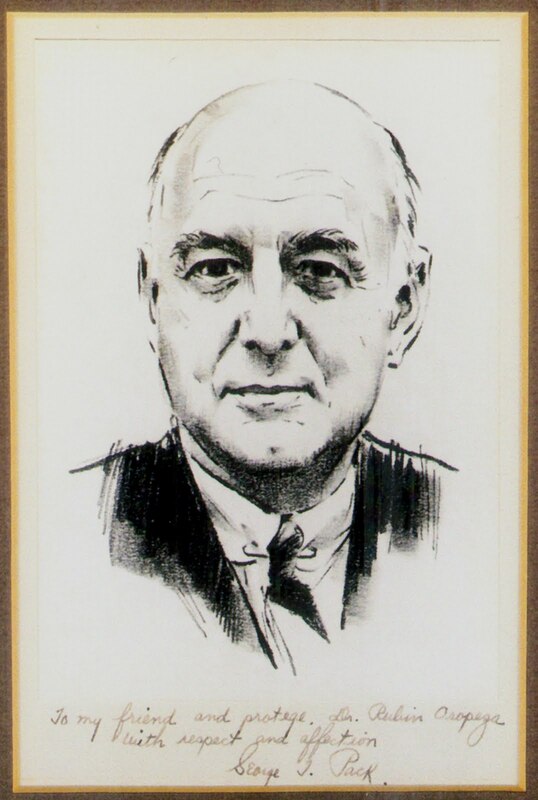 George T. Pack was one of the top cancer surgeons of the first half of the twentieth century. Among other important accomplishments, he founded the Gastric and Mixed Tumor Service where he was "Mr. Melanoma" at Memorial Sloane Kettering Cancer Center and treated countless international dignitaries, most famously Eva Peron and, surreptiously, Franklin Roosevelt. Ruben Oropeza from 1963 to Pack's death was Pack's closest protegee and confidante. After Pack's stroke and heart attack, Oropeza performed all of his surgery with Pack scrubbed in at his side. He was totally devoted to Pack and managed all his medical affairs. Pack confided in him as he did with only one other individual, Dr. Irving Ariel. Ariel was sworn to secrecy about many of the details of what Pack told him. 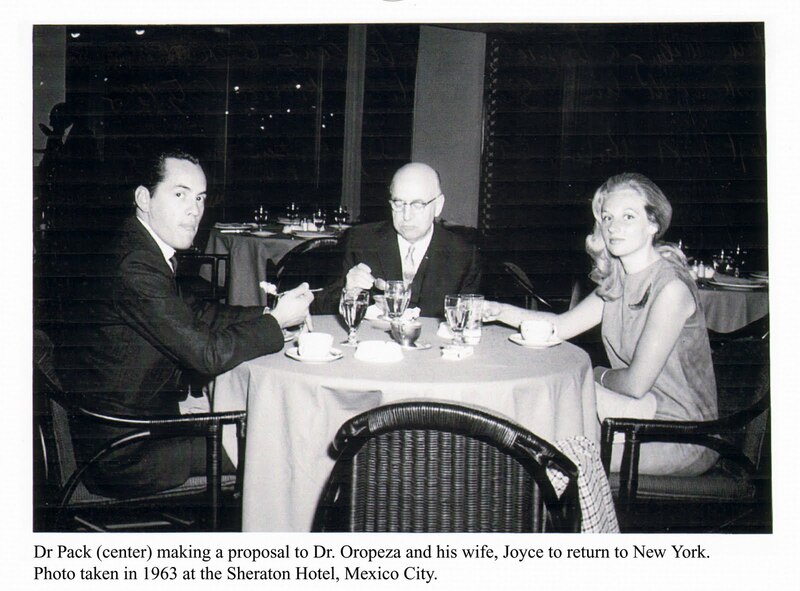 Oropeza is alive and well at age 81 and living in Texas and Mexico. Dr. Oropeza has related information to me that is reliable and authoritarian. His recollections about Pack are quite analagous and equally as reliable as those of Margaret "Daisy" Suckley were to FDR. As with Daisy, the vast balance of the material is an incredibly valuable and unique archive. I will be posting excerpts of his notes and hope to incorporate the material into a journal article. The photographs above were among the archive I have so far received. 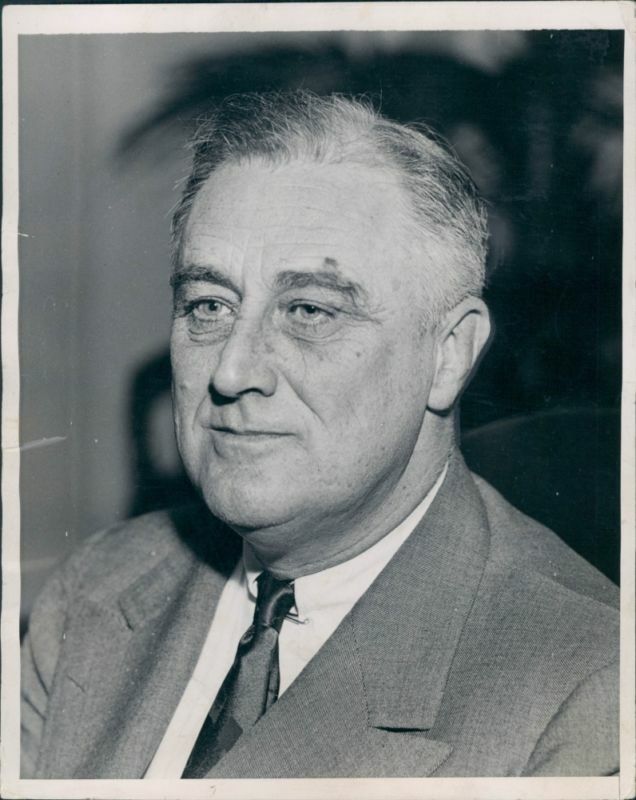 With respect to FDR, there were two operations he personally performed on the melanoma, one local and the other (with Frank Lahey in Boston) an abdominal "open and close" procedure. The dates are still unclear. Ruben Oropeza is the last living link to unlocking the truth of FDR. I will be posting excerpts from the material and hope to incorporate it into a more comprehensive scientific paper. I am incredibly fortunate to have been able to contact him. The vaunted NYT did not see fit to publish my response to Lawrence K. Altman's subltle yet effective hatchet job of our book. Today they feature an article bluntly stating the Alzheimer's disease is "untreatable". Perhaps hey will publish this letter, timely submitted. First of all, Alzheimers is not untreatable as the author bluntly states. There are two classes of drugs that have proven efficacy, albeit modest, that reduce progression and slow disability. Patients with early diagnosis might opt to begin these medications "off label" since they are only indicated for moderate to severe disease. I know I would. A good analogy analogy here is that, just like drugs for baldness, early use may not regrow brain cells, but can reduce the frequency of dropout. Early diagnosis and provision of patients with all therapeutic options is essential, not only for dementia, but for all disease. With current understanding, genetic counseling is an important adjunct to medical treatment. The days when patients not being informed of disease such as maligancies are thankfully coming to an end (though not as fast as some might think, especially in Japan!) The prevalence of AD (50% at age 85) mandates aggressive, state-of-the-art, measures at prevention of progression. 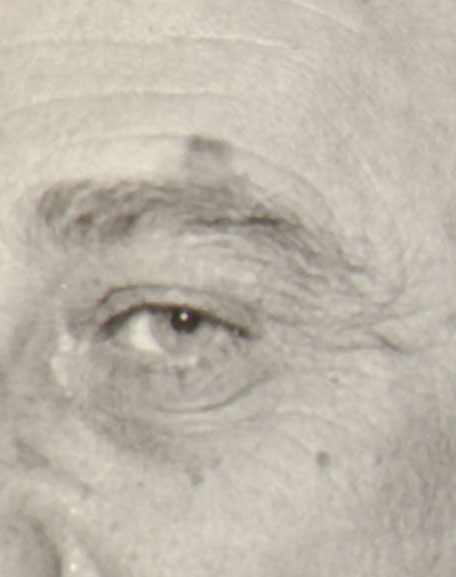 When Was the First Operation on FDR's Eye? 1935! Two photographs I recently purchased on eBay spurred my renewed interest in finding the date that FDR's melanoma was first operated upon. 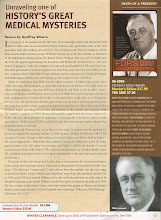 According to Dr. Ruben Oropeza, Dr. George Packs's closest protegee and an exceedingly valuable source of information, Pack was following FDR for a "Hutchinson's Melanotic Freckle" for ten years prior to his death and personally performed two operations on FDR, the first being a local excision, and the second, a much later "open and close" laparotomy with Frank Lahey and Isodore Ravdin. The photos below are entirely consistent with that scenario. The first was taken on January 30th 1935 and shows only the scar that had been seen on photos for at least twenty years and probably comes from the childhood incident described by Geoffrey Ward that occurred in early childhood. The second photo, taken 14 months later is dramatically different, with an entirely new scar in the eyebrow directly below the lesion. Remember, any notion of a malignancy by the public and FDR's political career is over. This dates back prior to the second term! Quite clearly the lesion was cosmetically removed beginning in mid to late 1940 (see the cover of the book that has a photo from mid-August 1940). By Pearl Harbor it was gone, with absolutely no other explanation other than staged surgical removal. I'll be shortly off to the FDRL yet again to comb through all of the 1935 photographs and FDR's daily schedule to try to determine with greater accuracy when the first operation took place. Obviously, more to follow. 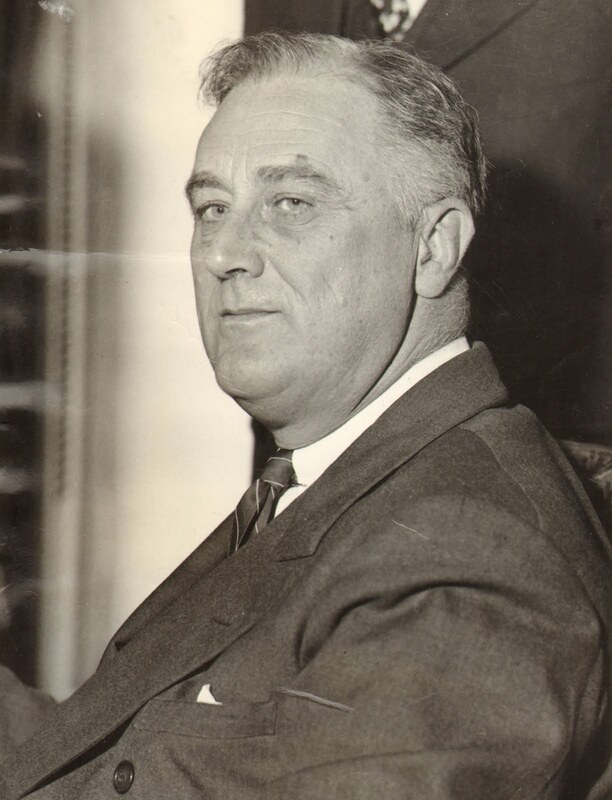 FDR's battle with his health was sooooooooooo different than has been portrayed and had a tangible and previously unappreciated effect on many of his political decisions. The paperback edition of our book is to released in two weeks. My paper in NEUROLOGY on FDR's epilepsy will appear on February 15th (I'll post a link to it on the blog after it is released).